In September, Secretary of Education Betsy DeVos rescinded Obama-era Title IX guidance related to schools’ obligations to address sexual harassment, including sexual violence–a move that will disproportionately impact LGBTQ people. Studies suggest that nearly half of bisexual women have been raped and half of transgender people will experience sexual violence at some point in their lifetimes. According to the Youth Risk Behavior Survey, a national survey of high school students, lesbian and bisexual women and gay and bisexual men experienced higher rates of sexual assault than their straight counterparts. The Department of Education also released a new Q&A on Campus Sexual Misconduct, which replaced the 2014 Obama-era Q&A on Title IX and sexual violence that was rescinded. Unlike the Obama-era Q&A, which explicitly mentioned LGBTQ students and that the “actual or perceived sexual orientation or gender identity of the parties [involved in an incident of sexual misconduct] does not change a school’s obligations,” the new Q&A erases all mentions of LGBTQ students and schools’ obligations to students of all sexual orientations and gender identities. Unfortunately, these actions are part of a wider pattern by the Department of Education to undermine the rights of LGBTQ students. 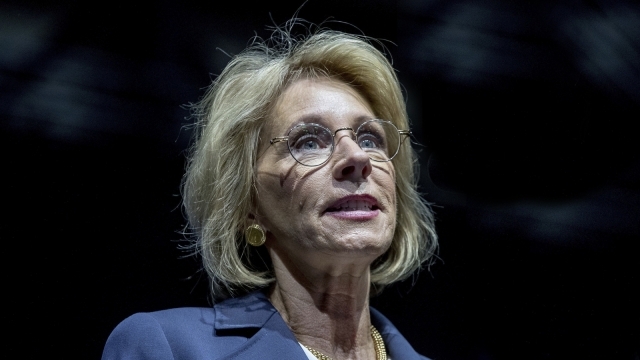 In February, DeVos and Attorney General Jeff Sessions withdrew important guidance that clarified schools’ obligations to protect transgender students from discrimination under Title IX. While students are still entitled to the legal protections guaranteed by Title IX, this action obfuscated schools’ obligations to transgender youth and sent a dangerous message that the current administration will not enforce inclusive policies or stand up for them at school. This was borne out when in hearings in both May and June, DeVos refused to commit to LGBTQ non-discrimination protections in in a potential federal voucher program. When DeVos was being confirmed by the U.S. Senate, HRC opposed her nomination. Unfortunately, Winterhof’s prediction has proven true over the past half a year. DeVos’ action is only the latest example that she is both unable and unwilling to defend the rights of LGBTQ students and ensure their right to learning in a safe environment.